Problem solving tips for ASUS FONEPAD & FONEPAD 7 with easy solutions. Finding a tablet with 7 inches screen with phone function can be good to see the ASUS FONEPAD & FONEPAD 7. Call function can be use directly without external headset, use the front phone speaker and the microphone to call. What is the different between ASUS FONEPAD vs ASUS FONEPAD 7 ? At first ASUS FONEPAD produce for user who need phone functions at this tablet, because ASUS Also already release ASUS MEMOPAD which without GSM data functions. Basically the product between ASUS FONEPAD and ASUS FONEPAD 7 topically similar. But the new ASUS FONEPAD 7 already use Intel Atom Z2560 and the previous ASUS FONEPAD use Intel Atom Z2420 or Intel Atom Z2460 . At 2014, there are also available ASUS FONEPAD 7 FE170CG in the market. Basically doing hard reset or reformat for ASUS FONEPAD 7 FE170CG are have same steps with previous Asus Fonepad 7 product. Please find about tips and tricks for troubleshot problem at ASUS FONEPAD 7 FE170CG. How to Fix or Problem Solving for Recovery ASUS FONEPAD & FONEPAD 7 / ASUS FONEPAD 7 FE170CG hang or not responding or malfunctions or stuck or freezing or bricked ? ASUS FONEPAD & FONEPAD 7 use Intel as processor and the specification is good for install and run application from Google Play Store. Do not worry about running and download big game or applications. The problem become happen when we download some non compatible or the application that not coding with proper way, this can make our ASUS FONEPAD & FONEPAD 7 become hang or stuck or frozen or bricks or LCD touch screen not responding. Try to do the soft reset or reboot or restart to delete some cache and temporary files. If the tablet still not run properly, then you have to do hard reset with master format. Becareful to do hard reset, because all important data and applications will be wipe and erase from ASUS FONEPAD & FONEPAD 7. How to Soft Reset or Reboot or Restart ASUS FONEPAD & FONEPAD 7 ? We can not open the battery easily to do soft reset or reboot ASUS FONEPAD & FONEPAD 7, because the battery is non removable. But when our tablet get problem, there are a Power button which can be press for several second until it boot or show the menu to turn off or restart / reboot. Do not worry about your data, because doing soft reset or reboot or restart will not delete any important data. How to Reset ASUS FONEPAD & FONEPAD 7 with PINHOLE? 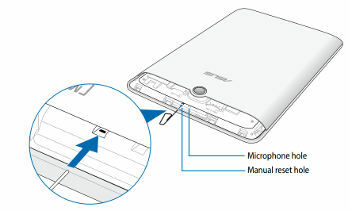 If the ASUS FONEPAD & FONEPAD 7 become unresponsive or hang or stuck, we can also doing force reset by pressing small pinhole with stick or paper clip. We need to open the back cover (upper side at back), then find the small hole near the microphone. After see ASUS LOGO, release the button at no.3. Press and hold together : Volume Down + Volume Up until the menu to reset appear. How to Restore and Reinstall Clean Android Operating system / firmware at ASUS FONEPAD & FONEPAD 7 / ASUS FONEPAD 7 FE170CG ? The clean and factory default ASUS FONEPAD & FONEPAD 7 Android operating system already saved inside ROM. If our ASUS FONEPAD & FONEPAD 7 tablet get problem and need to do reinstalling or restore the clean Android with factory default applications can be easily do with formatting or master reset. Please remember, doing reinstall or restore the operating system or firmware will make all data deleted and we need to reinstall specific applications again. How to Unlock or Fix or Bypass or Solutions for ASUS FONEPAD & FONEPAD 7 / ASUS FONEPAD 7 FE170CG forgot password code or security lock screen pattern or pin (lost password)? It is recommended to anyone who have ASUS FONEPAD & FONEPAD 7 for always keep secure our data from unauthorized user. We can give several option to protect it, using screen lock protection or password is recommended. If we forget about the answer of that security password pin or screen lock pattern protection, we can restore it with pressing Forget Password / Pattern button. This button will bring us to answer the username and password of Google account that already saved in this ASUS FONEPAD & FONEPAD 7. If we can not access the Google account, than we have to do hard reset with master format above. How to Improve Performance ASUS FONEPAD & FONEPAD 7 to make run more faster? Using Intel processor for ASUS FONEPAD & FONEPAD 7 give us good performance to run. But as we know some user also have problem with the tablet become slowly after several time. In this case usually happen because there are a lot of applications which run in the background and take so many tablet resources while they are updating or running. We are recommended to uninstall the un-use application and try to do soft reset after uninstalling. If the performance of ASUS FONEPAD & FONEPAD 7 still need to make more faster back to default, you may consider to performing hard reset. Is That Any Secret Code for Doing Format ASUS FONEPAD & FONEPAD 7 ? There is no secret hidden code for ASUS FONEPAD & FONEPAD 7 to make it back to factory default. Do the options above to hard reset it. How to Upgrade ASUS FONEPAD 7 Firmware to Android Jelly Bean 4.3 Operating System? The ASUS FONEPAD 7 operating system now already have update to newest Jelly Bean firmware Android version 4.3. All ASUS FONEPAD 7 user can update their tablet to Jelly Bean using Over The Air update (OTA), it mean everyone can update ASUS FONEPAD 7 to Jelly Bean using Internet data connection. Please make sure the battery is not empty and better connected the tablet with power charger while doing OTA update, because ASUS FONEPAD 7 will download big internet data of new firmware. Follow the step from Setting Menu > About > Software Update, some user will receiver status bar notification to update the newest Jelly Bean operating system. How to Upgrade ASUS FONEPAD 7 / FONEPAD 7 FE170CG to Android Kitkat or Android Lollipop operating system update ? The processor to upgrade the operating system for Android Kitkat also same process with Upgrade to latest Jelly Bean before, follow the steps to upgrade from menu Setting > About > Software upgrade. If the official update available for our ASUS FONEPAD & FONEPAD 7 / ASUS FONEPAD 7 FE170CG then the notification will be appear and we can continue to download from OTA (over the air). Until today, there are no official information to upgrade ASUS FONEPAD & FONEPAD 7 / ASUS FONEPAD 7 FE170CG to Android Lollipop, but the specification of this tablet are acceptable for running Lollipop, we have to wait latest official update for better operating system. There are also some other community give solutions for upgrade ASUS FONEPAD & FONEPAD 7 / ASUS FONEPAD 7 FE170CG to Android Lollipop using unofficial custom ROM, but we have to be careful doing this steps, because some wrong situations can make our tablet can not use anymore. How to Upgrade ASUS FONEPAD 7 / FONEPAD 7 FE170CG to Android Marshmallow or Android Nougat or Android Oreo operating system update ? This tablet basically will not get any firmware upgrade to latest version such as Android Marshmallow / Nougat / Oreo / Pie, because the development has been stop for this version. Once again we are not recommended to flash custom ROM at our ASUS FONEPAD 7 / FONEPAD 7 FE170CG, because some wrong steps will make this tablet can not work properly. Some not official ROM / operating system also will make some features not work anymore. How to Replace ASUS FONEPAD 7 / FONEPAD 7 FE170CG Battery or Make Battery More Stronger ? We have to know that ASUS FONEPAD 7 / FONEPAD 7 FE170CG battery s not removable, therefore we can not replace it easily by ourself. Please bring to Asus authorized service center to replace the battery especially after use more then 2 years, the battery life will end of life or downgrade. However, if we still want to make the battery work more longer, then please make some adjustment like make LCD screen brightness as low as possible. Do not use any connections when we are not active with that to make the battery not work harder. [Q] Hi sir my fonepad 7 can't detect on my computer because it's stuck on Intel logo any suggestion to do sir? I'm so damn down right now please help me. [A] Hi, please try to do hard reset using hardware button combination key like steps at #option 2 above. It will reformat your Asus Fonepad tablet operating system to factory default. [Q] Hi. The touchscreen of my Phonepad doesn't respond. Resetting it didn't help. The operating System seems to have gone crazy - it's activating apps without a command... What should I do? It's strange that the incomming notifications are still working. I see them but I can't access them... How can I resolve the problem? Looking forward for your answer. [A] Hi, if you have done hard reset or reformat the operating system to factory default but still get some troubles at your Asus Fonepad 7, then maybe the hardware got problems. You have to discuss with Asus authorized service center for further help. The information from this page describe about asus fonepad hard reset,hard reset asus fonepad,asus fonepad 7 hard reset,hard reset asus fonepad 7,reset asus fonepad,asus fonepad 7 reset,asus fonepad 7 recovery mode,how to reset asus fonepad,asus fonepad reset,how to unlock asus fonepad. If you need another resource for hard reset, use search function at this homepage or find from our related posts. My asus fonepad 7 is can’t on and charge battery also what should I do? Hi, Asus Fonepad 7 should work fine to charge if the hardware does not have problem. Usually if the battery totally empty, it will need about 5 or 10 minutes charge time before you can turn it on. You can try to charge 30 minutes, and try to make it On by pressing power button several second. If your Asus still can not on, we can try to do this step: Charge your Asus Fonepad about 1 hour or more, after that try to do Option 2 above step to do hard reset or master format Asus Fonepad 7 with hardware key. Hi, I’m surprise for the missing “User” option.. it’s a feature of 4.2 and I can’t see on the last 4.3 by ASUS.. Any suggest? The tablet is used by all the family so different accounts are pretty useful. That’s because you are using a customized asus launcher.. try disabling the asus launche so u will be forced back to android local launcher..
Hi, this is good news for every ASUS FONEPAD 7 user because we already get newest firmware or operating system update to Android 4.3 Jelly Bean, the process to update the firmware can be done by auto update with OTA (over the air) with Internet connection. The download process should be fine when we follow the step by step in the right conditions, but sometime after finish upgrade to newest operating system, ASUS FONEPAD 7 have several problems. Please try to do hard reset after finish upgrade to Jelly Bean, and the ASUS FONEPAD 7 should work normal again. i want to ask one question…why auto correction for fonepad 7 still enable but i will stop or disable…can u help me? 1.my fonepad 7 always hang then auto shut down after calling. there got some setting i can turn off, after upgrade to 4.3 my setting still there. but after reset, some setting on asus keyboard was gone. Hi, doing hard reset or master format is recommended after performing upgrade to newest version of firmware or operating system. This is also happen with ASUS FONEPAD. The upgraded version of Asus Fonepad should work normally. If you get problem, please try to do hard reset again to reinstall again the new operating system at our tablet. But if your phone still get the same problem after doing hard reset several time, then you may need some advice from Asus service center for further check. it updated it self to jb4.3 after that i had to choose my mobile network manually every time it does not register automatically. I AM THING of getting back to 4.2 but i dont know how can you help me?? Hi, some user have problem upgrade Fonepad 7 with Jelly Bean 4.3, but some user also solve the problem after doing hard reset or master format when the Android Jelly Bean 4.3 already installed. But doing format will removed all important data and applications. Please backup all data first. I have upgraded my Asus Fonepad 7 from Android 4.2.2 to Android 4.3, after which it is not detecting the mobile network and I am not able to make any call or use the mobile connection. Earlier it was working fine. I am planning to revert back to Android 4.2.2..
How can I do it…? Hi, basically at normal conditions we can not revert back our Android operating system to lower version, because some data already upgrade and has been change. When doing official upgrade or update at Asus Fonepad 7, the firmware will do the process without need to remove any important data and some installed applications still can be use without need to reinstall again. Maybe we still can downgrade our Android operating system, but this step usually will remove anything, and install from the beginning. This is what should you do when Asus Fonepad become problem or not working properly after upgrade to newer Android version. Some applications that we have installed before might not compatible or need to refresh after doing upgrade the firmware. Please try to remove it and reinstall again from Google Play Store. If you still get the same problem, then maybe you should consider to do hard reset or master format to clean up some wrong setting from previous Android version. After hard reset, you should resetting again from beginning. Hi, first you need to make sure is that any specific applications that make your Asus Fonepad screen become problems. If you already detect that applications, try to do uninstall. If you are not sure about which applications, you can try to do hard reset or master format first to make sure this problem come from hardware or software. If after doing hard reset the problem still happen, then the problem comes from hardware, you need to bring your Asus Fonepad to nearest Asus service center. I recently bought asus fonepad 7, few days ago. Recently my asus show android is upgrading but there is no differenciate in percentage still at 0% even i try to off and on still goes to the same screen which ” Android is upgrading”…. what happen actually there is any solution for this. Hi, the upgrading process at Asus Fonepad 7 will be done automatically as far as your Internet data connection does not have problem. Please check you Internet data connection or you can try using different Wifi to do Upgrade to new firmware. If the problem still happen, maybe you may consider to do hard reset first to clean up all wrong setting and delete blocking applications from beginning, after that try to do upgrade process again. But please remember, doing hard reset will make all important data and installed applications wiped or removed from Asus Fonepad 7, that is why you need to do backup first before performing hard reset. please tell me what actions should i preform to be able to surf the Net through mobile internet on my asus fonepad me175cg. Hi, your Asus Fonepad already have 3G data network, so you need to use GSM simcard with Internet data package to use with your Asus Fonepad. You also can use Wifi connection to surf or connect to Internet. Try to find Wifi ready area, and connect using specific key which given from Wifi provider. hi can i ask why everytime i download skype i can’t used it properly it cannot perform video calling and all the downloads application always missing. Hi, first you have to make sure the Internet connection is connect properly and running good. If you are using GSM to download, you may try to use WiFi Internet connection to make sure the problem is not come from the GSM connection. Usually if you have problem with Internet then the download and video connection should not work properly as well. If you have problem with camera, please try to use 3th party camera application from Google Play Store, but you should try to fix your Internet connection before download it. If you still get problem, then you should try to hard reset with options steps above, then try to use your Asus Fonepad 7 tablet to take pictures and connect to Internet again. Hi, the problem can be happen with hardware or software. First you need to try the software by download some 3th party camera applications from Google Play Store that can capture from front camera. If the new applications also can not capture from front camera, then you can try to do hard reset to make all setting back to factory default again, then try to capture with front camera again. If the problem still happen, then maybe your Asus Fonepad 7 get front camera hardware trouble, therefore you have to bring to nearest Asus authorize service center to get some repair. HI MY ASUS FONEPAD CANT OPEN WHEN I CHARGE IT THE BATTERY SIGN DIDNT SHOW UP BUT MY BACK OF MY ASUS HEAT UP WHAT TO DO PLEASE REPLY THANK YOU AND GOD BLESS..
Hi, the problem can be happen with your Asus Fonepad 7 tablet LCD screen, because maybe it can not show anything to display battery indicator and the running operating system as well. Usually when you are on charging and the battery temperature going up, then that is the simple indicator for the battery is on charging, if the battery full, the temperature going to go down and you will not feel any heat again either at the battery or at the power charger adapter. The tablet heat also can be happen when the processor working hard. You can test your LCD screen by trying to turn OFF and turn ON, usually you will see logo or any information regarding the tablet doing boot steps at your Asus Fonepad LCD screen. If you does not see anything, then your LCD should have trouble. Hi, you can try to download some 3th party volume control applications from Google Play Store, at that apps you can see the detail volume options like for Volume of ringtone, notification, media, alarm and maybe some more. If the low sound of volume problem still happen, and since you already done hard reset or master format, then maybe the problem comes from the speaker hardware problem or volume module at your Asus Fonepad 7 tablet. You can try to bring it to nearest Asus authorize service center. I bought Asus Fonepad 7 dual sim version, at 12 days in my possession it automatic send an update. After I installed it the facebook app didn’t function, I tried to uninstalled and re-installed it about 3 times but still same. So I decided to do the restore factory setting, after that its not turning on anymore even the battery is fully charge. Even the hard boot method specifying here. I returned it to the store where I bought and they send to their service shop. To Asus what could be the possible reason for that? and also I read some site forum, some complaining after they updated their unit the calling function did’t work. I hope you sort it out. Hi, this problems maybe happen because the latest operating system or firmware update version from Asus for is not work at your Asus Fonepad 7 Dual sim because of some reasons like hardware bug which triggered from latest firmware. Because usually Asus will do several test before release for update from OTA (over the air). Hopefully the Asus service center will fix your tablet problem. Hi, please try to open your menu Setting > Wifi and see weather the Wifi Name that you want to access already available at the list. If available but can not connect, then you should long press at that name, and delete by choosing Forget Network. Some Wifi can not connected by other device because the Security type is not right or can not recognize with the tablet, please make sure the security protections and Wifi password already correct. I updated my asus 7 FonePad 2days back after whenever am using internet in my pad its suddenly hanging why it was hanging? And how can i restore the old settings. Before update my pad is working well. I hope u will sort it soon. Hi, some applications may get trouble after upgrade to latest operating system version. If you also get this trouble, then after make sure all firmware or operating system upgrade already done, you should do hard reset or master format. Then please setup again your Asus Fonepad tablet with your Google account and use again Google Play Store to download applications that you need to use. my Asus phone automatically.. end outgoing call… bt i can receive calls.. plz someone help me……..
Hi, please try to do hard reset or master format with hardware steps above. First we are recommended you to do hard reset follow #Option 1 using software menu because you still can access the menu. Otherwise you can try to hard reset using hardware button at #Option 2 above. Hi, if you forgot the security pattern at your Asus Fonepad 7, but you also forgot Gmail email and password, then you may to do hard reset with hardware button like #Option 2 above. I bought new Asus Fonepad Dual sim, after which i inserted the micro sim into the slot, and when i tried to remove it from the slot but it won’t come from the slot. Now it is stuck in slot. Kindly assist me to remove the sim card at earsliest. Hi, first time insert the simcard or memory card as well, we need to press it until it locked at the slot. To remove it, we need press it again like we insert at the first time, then the simcard will be unlocked and ready to release from the slot. Please try it again carefully. Hi, are you charge it when the phone at OFF positions? Please try to turn ON your Asus Fonepad 7 and charge again your tablet. If you can not charge it when the phone at ON positions, then maybe you should try to charge with different charger to make sure your charger still OK, but you need to use the same specification for Asus Fonepad 7 charger to try. Better with the same charger as Asus Fonepad 7 charger (other charger). My Asus fonepad is working bit slow, when i move the pattern it takes time to open and sliding is bit slow, please help me out and my fonepad internal memory is filled with 6gb only and its 16gb internal memory then also slow. Hi, basically the 16GB will be devide into internal memory for system and the other for save the data as virtual sdcard, also some space already use for installed OS + applications, therefore you will find only 6GB left for internal memory. If you phone become slow, it could be happen because too many applications run in the background. Some applications that you install from Google Play Store will keep run in the background without any notice to wait for some command or data update. If there are too many applications run in the background, then your Asus Fonepad will become slowly because of limited RAM and processor resource. Please find that applications and uninstall it. If you can not find that applications and need to make your Asus Fonepad performance become faster again, then you should consider to do hard reset. But please do not forget to do backup before doing hard reset, because all internal data and installed applications will be removed or wipe. Hi, doing format is the same steps with doing hard reset at your Asus Fonepad. Therefore, please choose one of the following options to hard reset above. First of all we are suggest you to choose hard reset using Software Menu, because it is easier to do. Please do backup all important data first before performing hard reset or master format, because all data will be wipe or removed. Hi, we are not sure about the problem at your Asus Fonepad after upgrade to Kitkat, but you already done the right steps to hard reset to factory default to make sure your tablet working properly. Download to upgrade from OTA does not have options to downgrade from OTA as well, maybe some users reinstall with non standard steps, but this will cause problem if we get some wrong steps. However, please consult to Asus service center for further help. Please help me.I cannot use mobile data connection its not turend on. Hi, please meke sure your sim card Internet data network subscribtion already active or try to use other different simcard which already have Internet data. However, if you are sure your simcard is fine but you still can not activate the data network at your Asus Fonepad, then you should try to do hard reset or master format. But please do backup for all important data because it will wipe or erase. I cannot turn on my wifi on my Asus fonepad. It was working perfectly yesterday. I already performed a factory reset but still wifi won’t turn on. How to fix this? Hi, usually after doing hard reset the tablet will run with factory default setting, then your Wifi will run again. However, if you still can not activate the wifi (wifi can not turn on) then we are worry your wifi hardware damage, please bring your tablet to Asus service center for further check. i had the same problem, since 1 week.i googled it a lot, but no result. AFTER RESET CHANGE THE LANGUAGE TO ENGLISH US, KEYBOARD INPUT ALSO TO ENGLISH US. AND NOW CHECK IT OUT……. Hi, please try to use Setting Menu > More > Mobile Network > Network Mode, choose WCDMA Only. You also can download some applications from Google Play Store to set your tablet only work at 3G Only. Hi, at normal situations the installed applications will not uninstall or deleted by itself, unless you have rooted or do some other non standard tweak. Please make sure both internal memory or external storage are not insufficient or not full. If everything fine, then you should need to reformat or hard reset your Asus Fonepad 7 to clean all non appropriate installed applications, and start to download and play that kind of games again one by one. Hi, there are 2 possibility about your problem, one is because the software and the other one is because the hardware. Please try to do hard reset to reformat the clean factory default Android operating system at your Asus Fonepad 7, after that try to use microphone again. If the microphone still can not work, then you have to consult with Asus service center because your tablet still have warranty. Hi, doing update with OTA (over the air) usually does not have OTA steps for downgrade to Jelly Bean, the downgrade itself is not recommended because usually the upgrade will fix some bugs. However, if you also get trouble with official Asus Kitkat 4.2.2 for Asus Fonepad 7, then better you wait for fix update from Asus official. Sir. I owned ASUS fonepad 7 with dual sim. With jelly bean OS. Im having problem wih my tablet. It cannot turn on. It happened after im woke up, and found my tablet over heat (its really hot). I even not plugged in the charger on it. Im aware of what will happens next. Scare of something turn whorst then Im turning it off, but after several minutes i try to turn it on it cannot charging at that time till now, the battery kept decreasing even i plugged in the charger. I did hard reset, format factory. It cannot turn on . I wait about an hour it doesnt want to turn on. Usually it doesnt take time so long. So i did other option, using fastboot command entering bootdroid provision OS. I choose recovery and still cannot turning on. Sometimes my tablet showing USB logo (thing like trisula) with red bar on below that sign when i press the power button. Could u help me knowing what problems on my tablet and give me solution or advice ? Hi, please try to follow the steps to hard reset using hardware button, if your Asus Fonepad 7 still can not work normally, then some trouble like broken operating system happen at your phone, or some hardware trouble as well. Please bring you Asus Fonepad 7 to neareset Asus service center. I have asus fonepad 7 175CG…..while i m in call there is a light blinking near front camera and its giving some irritation to ears…..Why it is happening so…. Hi, please make sure you have never installed applications that make this problem happen at your Asus Fonepad 7. Please try to do soft reset or reboot, and test to make a phone call at your tablet. If the problem still happen, then you have to try doing hard reset or reformat your Asus Fonepad 7. Please do not forget to backup all important data before doing hard reset. Hi, unfortunately you can not bypass or unlock forgotten security protection at Asus Fonepad 7 if you never signed in at Google account when the first time using this tablet. The only solutions to bypass or unlock your Asus Fonepad 7 is with hard reset or reformat using steps at #Option 2 above. Just for other possibility, you also can remove the external memory card at your Asus Fonepad 7 and read your microSD card with card reader using computer, hopefully you still have some important data at your microSD card. Stuck in boot after using just few weeks, What can i do if I do not want to hard reset and lose all my data ? Hi, unfortunately you have to perform reformat or master hard reset using hardware button combination key when your Asus Fonepad get stuck in boot loop, and you have to prepare all important data will be removed from your tablet. Hi, the first steps that we have to do when our Asus Fonepad 7 tablet stuck at boot logo loop, then have to do hard reset using hardware button combination, but if you have already done this steps with the same trouble result, then you have to consult with Asus authorize service centers. cannot install apps in fonepad 7 at default locations ? Hi, any installation from Google Play Store or manual APK files will by default install it at internal memory. Some applications maybe can separate their installation files like games, they will install main applications at internal memory and data files at external memory. Hi,i was rooted my asus fonepad (fe170cg) tablet.But root not complete.now my tablet show asus demo stopped again and again.now i can’t restore also because personal restore is not showing.help me please to restore completely my tablet. Hi, unfortunately we can not give right answer for your trouble, because rooted your tablet can be done with several non standard steps and sometime that steps can make your Asus Fonepad tablet become corrupt and can not fix with standard procedure. Please contact your previous community which give you steps to root, mostly they have fix steps when you get trouble while following they procedure. Hi,,I hv a Asus fhnpd 7 ,175cg. Can i connect cordless hidden camera ,with my tab?? Hi, sorry we do not understand about what kind of cordless hidden camera that you mean. Howeever, if your external device have ability to connect using Bluetooth or Wifi then please make sure that device can work at Android or web browser. Usually Asus Fonepad 7 can work with that. I have accidentally update it to Android 4.4.2. How do I downgrade back to Android 4.3. Hi, doing update using OTA at Asus Fonepad is very easy, just follow the menu information and update will be finish at several minutes. However, this is different with downgrade, because basically downgrade can not do using OTA or using same steps with upgrade, you should do some non standard steps and this is not recommended. If your Asus Fonepad 7 still get trouble after doing update firmware, then we suggest you do hard reset or reformat to factory default and reinstall some needed new version applications from Google Play Store, sometime previous installed applications not compatible with new firmware update. Hi, if your Asus Fonepad can not success doing update by Over The Air then you should consult with Asus authorize service center for further check. Hi, unfortunately it is difficult to restore Asus Fonepad bricks if you have done some custom tweak, because there are some possibilities for fix that problems. Maybe someone else can help you, but we suggest you contact the web or video owner that give tutorial for doing that, hopefully they can give solutions for your problems. Hi, My Asus fonepad 7 (K012) could not load setting and other apps after I did a hard factory reset each time it come up with “unfortunately, asus setting has stopped” what can I do Please? Hi, maybe the hard reset or reformat process does not work properly at your tablet, please try to do it one more time and after finish doing hard reset, do not login with any account. Just try to use with default applications or browser after connected to Internet data connection. Because sometime cloud backup can be restore automatically when we login with our previous Google account. Hi, I have K019 asus fonepad. My problem is keyboard input, default keyboard always change from swiftkey keyboard back to asus keyboard after my phone out of battries and self shutdown. Hi, usually if you have already choose and set as default for swiftkey keyboard input at your Asus Fonepad, then it will not back to Asus factory default again. You have to make sure the Asus default keyboard is not choose at all at Setting menu. Just give select option only for Swiftkey keyboard applications at your setting menu. My Asus Fonepad 7 has a micro sim card stuck in the slot, it was put in the wrong way. I’ve tried a lot of things to get it out….Please help. Hi, well you should use small pin-set tools to take your wrong direction memory away from external memory slot at your Asus Fonepad 7. Please do it carefully and gently. If you still can not remove out your microSD from your Asus Fonepad 7 tablet, then you may ask help at Asus authorize service center. Hi, after click install to update my asus fonpad it shuts down for a while thenwhen i turned it in it is stuck on the first screen. What will i do? Hi, you should try to force soft reset or force shutdown by using small pin hole button after open the back cover case, please see information and picture above. 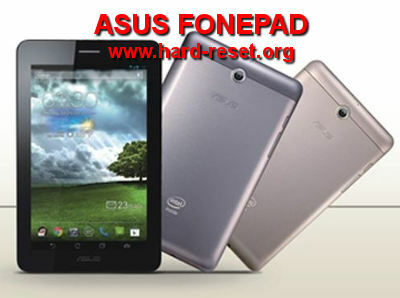 If your Asus Fonepad still get that problems, then you should doing hard reset using hardware button combinations key. Hello, my ASUS fonepad 7 FE170CG restart by itself about every three or four minutes! I dont know what to do?? It is very annoying and I cant do anything at all! Please help me what to do? Hi, we suggest you to do hard reset or master format to factory default, because it seems that some applications make your tablet become trouble like this. But please remember, doing hard reset Asus Fonepad 7 FE170CG will remove or wipe all important data, please do backup first before doing hard reset. We also suggest to remove external memory microSD card before doing hard reset. Hi everyone, i am using asus fonepad 7 ME372CG, i have a problem after updating my device as ealier my device used to show pop up apps on the screen but now i am not able to use that feature as there is no button on screen which allows me to do so as it used to be in jelly bean os. Please help me out i am very upset becaz of this thing.. thankyou and pardon me for any spelling mistake . Looking forward for your reply. Hi, maybe your latest update firmware already change the way to show pop-up at your Asus Fonepad 7 ME372CG. Maybe someone else can give other advice, but as far as your tablet has already worked normally, then enjoy your new updated firmware at Asus Lenovo Fonepad 7. Hi, have you ever done hard reset or master format properly? Please try to do hard reset again one more time using hardware button combination key at your Asus Fonepad 7, and after hard reset finish, please do not sign in with any account. Just try to use Fonepad 7 to browsing the Internet or using factory default applications. After everything runs properly, then you can try to sign in again. If after sign-in the problem still happen, then maybe there are some old trouble maker applications restored at your Asus Fonepad 7 tablet, please find that apps to uninstall or reformat again and sign in with different Google account. i bought my asus fonepad in saudi arabia and since then i never try to put a sim card on it.until i go back home in the philippines,i was curious if i can put a local sim card and it says to no service in all he sim card i put in. what is the problem?and how can i resolve it? Hi, we do not know weather you have bought the locked GSM Asus Fonepad or not. You should bring your tablet either at Asus service center or GSM provider service center, but maybe bring to Asus authorize service center is recommended, they should give good advice for your problems.